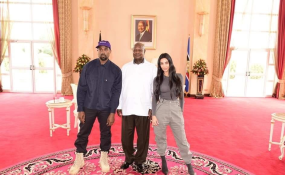 Museveni met the Kanyes at State House Entebbe; two days after the celebrity couple arrived in the country for a fun filled trip combining a holiday, philanthropy work and business. But the visit has been met with criticism in and out of Uganda. Kyadondo East MP Robert Kyagulanyi, also known as Bobi Wine branded the visit "immoral" and accused Kanye of using his influence to hobnob with a president who restricts freedoms and tortures opposition. There was also speculation that the Ugandan government was funding the trip under the guise of promoting Uganda as a tourism destination. Unconfirmed reports say as high as $10m (about Shs 37bn) was paid to the Kanyes to come to the country. Prof Kamuntu says that the Kanye and Kim's visit was a great celebrity endorsement for Uganda and that the president being the chief marketer of the country could not let the two leave without an engagement, encouraging them to promote Uganda's tourism and arts industries. Kamuntu was addressing journalists in Kampala. "He's not the first one to meet the president, but given the status and attraction and fame that he has, meeting the president is very natural. I should add this; the president is the head of state, he's our chief marketing manager for this country... If you're the chief marketing officer of the country and Kanye comes, why would you not meet him." Kamuntu said. Kamuntu says that his ministry and the president are convinced that Kanye and his family will continue marketing Uganda after their vacation since they have tasted and experienced its natural beauty. Kanye pledged to work with the government to construct a hospitality training institute in Uganda to boost the tourism industry, according to Kamuntu. Kamuntu said that he has since received many calls from all over the world asking about Kanye's visit. He says that the celebrity endorsements on social media will sell Uganda and its beauty to the global audience. "If you knew how many people are following that Kanye, who, must now begin to ask questions about Uganda, who must be curious, who must want to know what attracted him to Uganda. And he himself is very comfortable, it's wonderful. I have received international calls from France, from United States - all of them inquiring about Kanye and am telling them Kanye is enjoying himself and he's meeting the president and am telling them you can't beat it, join him." Kamuntu said. The celebrity couple arrived in Uganda on Friday last week and are residing at Chobe Safari Lodge in Murchison Falls national park. Kanye, a renowned rapper is using part of the visit to record some of the songs off his album Yandhi which according to reports, he wants to capture nature.